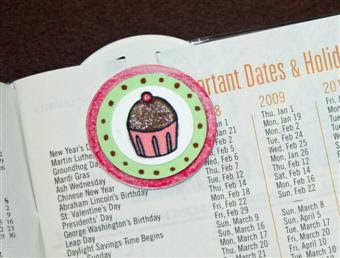 Stamp a Sweet Impression: Cupcake Calendar - a perfect little gift! 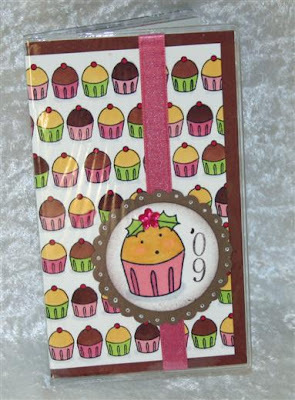 Cupcake Calendar - a perfect little gift! 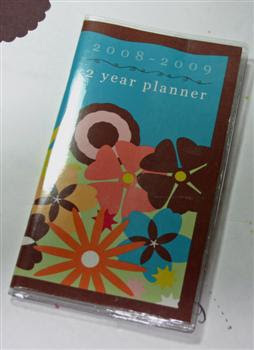 I started off with a pocket/purse calendar with a nice heavy plastic cover. You can usually find these this time of year at Michael's or Big Lots for $1-$2 each. As you can see mine is a 2-year planner left over from last year - it's still got one good year left! LOL! I also made a matching clip to mark my place in the current month of the calendar. This package of Basic Grey Book Clips was one of those too-good-to-pass-up finds at Big Lots awhile back! Now let's get down to the creative process. I chose just a few of my favorite colors to work with keeping in mind that I wanted to keep the brown border on the existing calendar cover and simply make a wrap slightly smaller. 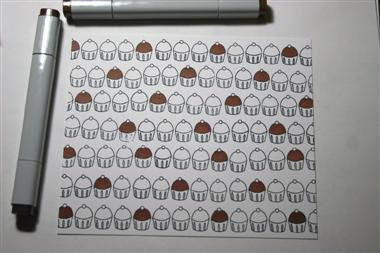 I stamped the line of cupcakes repeatedly. Since these rubber stamps come unmounted for use with an acrylic block I was able to stamp this pattern without even using a stamp-a-majig. I have several photos here just to show you the progression of the coloring pattern since sometimes it can seem daunting to create a seemingly random pattern. 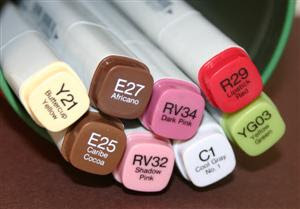 I started by coloring the tops of every fourth cupcake milk chocolate (E25). 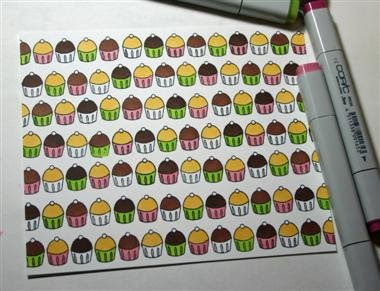 Next I filled in every middle cupcake with dark chocolate (E27) and the remaining cupcakes with lemon flavor (Y21) - yumm! 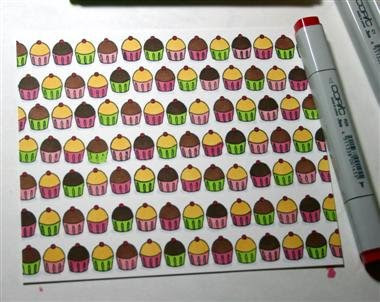 While the pattern for the top of the cupcakes started by coloring every fourth one, I started coloring the wrappers using green on every third one and filling in with light and dark pink. Coloring the tops every 4th and the bottoms every 3rd gives more of random feel to the pattern. 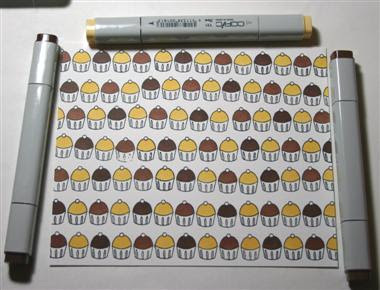 And here's the finished panel with all the cherries colored in red and a little swatch of gray to ground each cupcake. My coloring is far from perfect on this and I did no shading whatsoever - just super basic sit-in-front-of-the-tv coloring! This panel was then adhered to the existing calendar cover and decorated with rose satin ribbon from TE (also part of the Christmas Key Ingredients) along with sweet Holly. Since I didn't want her to look like a Christmas cuppie this time I colored her lemon with a pink wrapper and added a pink Kaiser Craft flower rhinestone to her holly leaves to make her look more like Spring! This could also be done with a small flower punch. The '09 is from one of my JustRite Stamper sets. I currently have a bunch of them all mixed up in a little plastic bin on my stamp table so I'm not certain which set they came from. 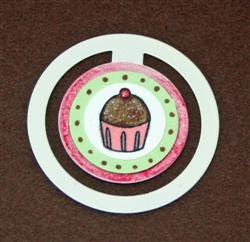 Holly was punched out with a Marvy circle punch and layered onto brown cardstock (Christmas Key Ingredients) that was punched with a Marvy scallop circle. And here's my finished calendar. Calendars like this were one of my first stamping projects years ago and I still love to make them and give them for gifts....although I think I'm keeping this one for myself. Shhhhhhh. I love the addition of the little book clip. If you can't find these particular clips a jumbo paper clip would also work well. 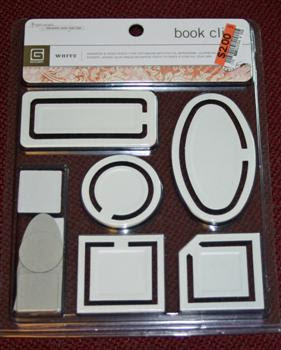 I'd love to see what non-Christmas looking projects you come up with using the newest holiday sets from SASI. Be sure to use Keyword SASI when uploading your creations to SCS so we don't miss a thing. And don't forget, we'll be on the lookout every week for a new SASI stamper to feature right here as Our Friday Friend. Remember it's so easy to play! How cute! - Wow, that's a lot of coloring but it looks fantastic! What a great project and a wonderful gift idea. Great coloring. TFS. What a great idea! I have those book clips from Big Lots, and I bet I can find a calendar around here somewhere. Thanks for the tip!! What a great idea! I just bought one of these calenders the other day. I wasn't thrilled with the photograph the calender came with. Now I can make my own! Such a great idea!! Thanks for the little head start for stocking stuffers!! Very cute, Jami! I love all those cupcakes! The coloring is great, what Fun!! So cute. I love the finds at Big Lots. Yesterday they had a Martha Stewart Christmas Holiday Stamp Set for $5.00 and MM stickers for $1.00.